Before Kamala Harris became a district attorney and a United States senator, she was a little girl who loved superheroes. And when she looked around, she was amazed to find them everywhere! In her family, among her friends, even down the street--there were superheroes wherever she looked. And those superheroes showed her that all you need to do to be a superhero is to be the best that you can be. 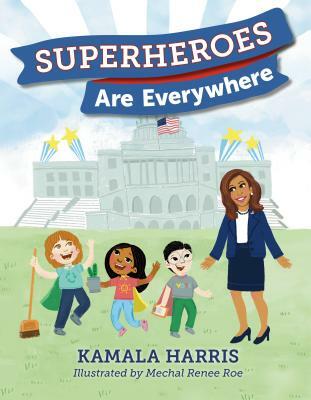 In this empowering and joyful picture book that speaks directly to kids, Kamala Harris takes readers through her life and shows them that the power to make the world a better place is inside all of us. And with fun and engaging art by Mechal Renee Roe, as well as a guide to being a superhero at the end, this book is sure to have kids taking up the superhero mantle (cape and mask optional). Kamala Harris (kamalaharris.org) serves as a U.S. senator from California. Before becoming a senator, she worked in the Alameda County district attorney's office, and was later elected district attorney of San Francisco and then Attorney General of California. The second African American woman and the first person of Indian descent ever elected to the U.S. Senate, she works hard to make sure all people have equal rights, especially kids. You can follow Kamala Harris on Facebook at Facebook.com/KamalaHarris or on Twitter @KamalaHarris. Mechal Renee Roe is an artist, designer, writer, and all-around creator. She loves creating for books, film, art, and animation. Originally from St. Louis, Missouri, she now lives in Atlanta, Georgia. You can follow Mechal Renee Roe on Instagram, Facebook, and Twitter @happyhairgirls and @mechalroe.